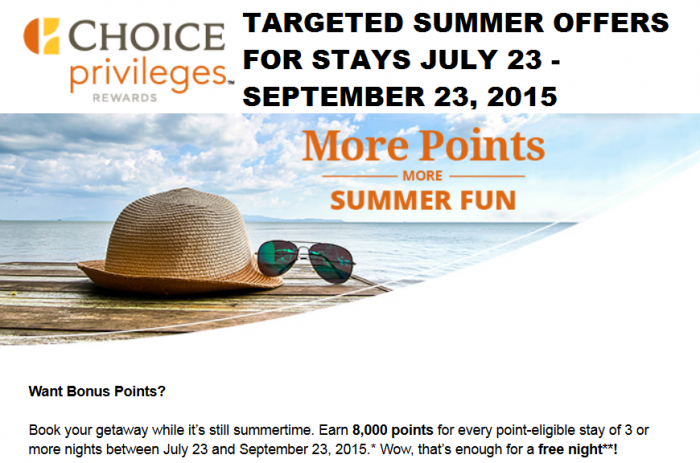 Choice Privileges has been sending out targeted Summer offers for bonus points (check your emails!) that you can combine with current on-going global promotion. The version of this targeted offer that a reader forwarded to me is 8,000 bonus points for each stay of minimum of 3 nights between July 23 – September 23, 2015. There is no landing page for this offer on Choice’s website, but you can make your reservations here. This is nice bonus for those that have not yet completed the global summer promotion that partially overlaps with this one. Nothing is better than double dipping on promotions! Next articleFabulous Fridays: Park Hyatt Tokyo Diamond Benefits – Excellent!